There were a ton of new polls out on Thursday; 39 in 25 states to be exact. The story, though, continues to be that there just isn't any perceptible tightening in the race for the White House. Sure, you can cherry pick results, but the overall picture shows the race continuing to trend toward Obama as opposed to being closer to a draw -- in most of the blue states at least. The polls out of Pennsylvania and Virginia were closer than they have been but are still outside of the margin of error for Obama. But in the red states, the story is different. No, not across the board, but there is some narrowing in many of the states outside of the far right column of the Electoral College Spectrum below. [Well, Obama keeping it under a 30 point margin in states like Idaho or Utah would resemble a narrowing effect, though it doesn't probably meet the criteria Jim Campbell had in mind when he described the phenomenon in the American Campaign.] It doesn't mean that states like Arizona, Louisiana or South Carolina are going to turn blue on Tuesday, rather it means they'll be much more "competitive" than they were just four years ago. 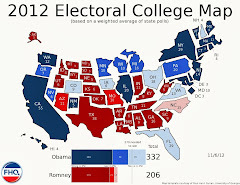 **The numbers in the parentheses refer to the number of electoral votes a candidate would have if he won all the states ranked prior to that state. If, for example, McCain won all the states up to and including Colorado (all Obama's toss up states plus Colorado), he would have 274 electoral votes. Both candidates numbers are only totaled through their rival's toss up states. In those cases, Obama's number is on the left and McCain's is on the right in italics. ***Colorado is the state where Obama crosses (or McCain would cross) the 270 electoral vote threshold to win the presidential election. That line is referred to as the victory line. It is currently favoring Obama, thus the blue text in that cell. New Hampshire's move doesn't change the electoral vote distribution (only Florida and Missouri will be able to do that between now and Tuesday, it appears) between the two candidates, but it does alter the Electoral College Spectrum from the way it has been (in that middle column) for weeks. We have seen some red states shuffle in and out of the bottom of that middle column but New Hampshire and Colorado have been the mainstays at the top. Not anymore. The Granite state switches positions with New Mexico, giving the area above the partisan line a distictly western flavor to it. And given the early voting in both Colorado and New Mexico, those two are virtually shut down for McCain. Obama has gotten solid turnout in early voting there and that coupled with the high overall early turnout is ominous news for the McCain campaign (as Scott has shown us). As we head into the final weekend, then, the indications are that Obama is in a comfortable position with no readily available signs of that trend abating. As I said earlier, the thing now is to keep an eye on those toss up states and especially Florida and Missouri. Those two are the states most likely to change here at FHQ between now and Tuesday and shift electoral votes in the process. But keep in mind that these states are toss ups for a reason: they are close. ...and susceptible to a last minute November surprise? Maybe, maybe not. What effect does that have on election day turnout? 2) a) People say, "Hey, the lines will be short(er), why not go vote!" b) "Wow! I want to be a part of this!" Over this past weekend we had a discussion going about the effect the presence of early voting in a state would have on the McCain campaign's home-stretch strategy. The basic hypothesis was that states with early voting -- where Barack Obama would have some votes in the bank heading into election day based on the advantage the Illinois senator has enjoyed in early voting -- would not be focused on as heavily as states where early voting and absentee voting were minimized. In other words, if something were to happen to change people's minds in some way, you'd get more bang for your buck if you were campaigning the hardest in states with as little early voting as possible. States like Pennsylvania and Virginia. But we can push this concept a little further. And, in fact, SarahLawrenceScott has done just that. If we were to look at the early voting information we have access to so far in this cycle and gauge whether that looks like it is on track to surpass the numbers from 2004, we can then make some basic assumptions that may give us a better idea of why the McCain folks are focusing where they are focusing. Assume something triggers a 4% loss for Obama (this was roughly the size of the Rev. Wright/McCain clinches drop, the Palin drop, and Obama's "soft" support in current polls) whether an Obama revelation or some geopolitical. We'll call it a November surprise. Assume a 2.5% overperformance for Obama in early voting. In other words it is not that a greater proportion of his supporters vote early, but rather that GOTV would push his numbers up in a state that had 100% early voting. Assume 50% of undecideds who vote early go for Obama. Assume that after the surprise, just 20% of election day undecideds go for Obama. If we take these new, post-November surprise state margins and apply the three-category thresholds that FHQ employs -- >7% = strong, 3-7% = lean, <3% = toss up -- we end up with a map that has toss ups that look an awful lot like the targets the McCain campaign has. Virginia would flip back to McCain. Pennsylvania would be much more competitive than what the polls show, as would Ohio. And Florida and Wisconsin would look like dead heats. It could be argued that, well, those are the toss ups anyway. Well yeah, except Minnesota, Pennsylvania and Wisconsin don't really fit the bill according to recent polling in each of those states. However, the goal is to consider not only the potential effect early voting has, but to ascertain whether strategically, the McCain campaign is hedging its bets, hoping for something akin to the George W. Bush drunk-driving revelation (Though, perhaps it would have to be bigger) that broke during the final weekend of the 2000 race, happening in this race. Maybe, maybe not, but the decision to focus resources on the three states I just brought up looks more rational in this light than it does on the surface. NOTE: I want to thank Scott for putting this material together and sharing it will me. It really adds to the earlier early voting discussion we had. 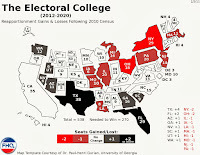 The following is an electoral college forecasting model that grew out of a paper Paul-Henri Gurian and Damon Cann first presented at the Western Political Science Association meeting in San Diego, CA this past March. The inherent value of that paper was its power in explaining that the variation in the two-party vote shares over the last 15 presidential elections (1948-2004) was based on a combination of national and state-level factors, the latter of which were separated into long- and short-term influences. It is a natural extension, then, to utilize the data from those 15 elections to project the 2008 electoral college outcome. What follows is a brief summary of the model and a discussion of some of the issues both Paul and Damon see in it. As Paul said, "The forecasts in the paper are really preliminary. However, if we wait a few months, till we've re-specified the model, it won't be a forecast anymore." Questions, comments and concerns can be left in the comments section. I will forward them to Paul and Damon. There is no shortage of presidential election forecasting models, academic or otherwise. In 2008, there are at least 15 political science forecasts, the average of which shows Obama winning approximately 52% of the two-party vote. Most rely on some combination of economic factors, presidential approval and/or incumbency to explain vote shares in presidential elections. Those factors are completely national in scope and what is lost in the process are many of the relevant state-level variables that could play a role in determining the electoral outcome. To be sure, there are also forecasting models that include state-factors, but what Paul Gurian and Damon Cann have done is to draw a distinction between the long- and short-term, state-level influences. [You can view their forecasting paper here.] In much the same way that the past polls in FHQ's weighted averages serve as an anchor to the short-term fluctuations in state polling, the long-term factors included in this forecasting model allow for historical, state-level factors to serve as a baseline of sorts for their forecast. The result is a rather close outcome between John McCain and Barack Obama. The line between a solid and a toss up state is whether a state's division of the two-vote is within the margin of error. You'll no doubt notice that there are several states that are on opposite sides of where they may be expected given other forecasts and projections. Iowa, New Hampshire and New Mexico, for example are shaded in red while Arkansas, North Dakota and West Virginia appear in Obama's column. toward McCain more than has actually happened in this instance. Without that, McCain would still be in the margin of error. suggest it ought to be perhaps R leaning but still battleground. generating more error than it would eliminate. error and WY as the other). I want to thank both Paul and Damon for sharing this and I hope that we can get a good discussion going that will generate some helpful feedback. NOTE: In the interest of time over these next few days, I'm more inclined to give the daily map updates short shrift unless an definitive change in the dynamic of the race occurs. I am loath to go the "short post" route but I've got some really good stuff I'd like to get out ahead of election day. And no, I don't say that with any sort of arrogance. I've actually got some outside contributions that will add substantially to our home-stretch analysis here at FHQ. As I mentioned in yesterday's update and again in the comments to last night's live blog of the Obama infomercial, I've got a post ready on the potential impact of a November surprise. Scott's done the legwork on that and there are some pretty interesting findings there. Also, after bugging them all semester, Paul Gurian and Damon Cann have graciously given me the exclusive rights to bringing their presidential forecasting model to the blogosphere. Well, that makes it sound as if they were unwilling to share that with me. They weren't. Both have been on board with the concept for a while now; they've just been tweaking things in the model. Another day, another 31 polls at which to look. Over the last few days, we have led off by talking about the polls in red. Well, if McCain is going to get back in this thing -- at least by our measure -- there are going to have to be some favorable polls for the Arizona senator. Sure, we can talk about Obama's continued lead in the polls throughout most of the toss up states, but that isn't as interesting as trying to strategically devise the ways in which the McCain campaign could make a race of it between now and Tuesday. And that starts with polling at least heading in his direction. On Wednesday, however, there wasn't any real indication that that sort of trend was emerging. There has been some tightening on the national level, but in the states that appear to be the decisive ones in 2008, there is little or no evidence that the national trend has extended or will extend to the state level. And that is a problem for the McCain campaign. The only poll the Arizona senator can hang his hat on following Wednesday's poll release, is that CNN poll that has him up 2 points in Missouri. And even that is a stretch since the Show-Me state has been hovering in the +/-2 point range for a week or more anyway. That is pretty much the message to take home from this collection of surveys. It is a par for the course day. If we focus on the states with two or more polls on Wednesday, then we see a number of states -- Colorado, Florida, Pennsylvania and Virginia -- where Obama's margins are strikingly consistent across polling firms. [It should be noted that the polls above for Florida make it look as though the Sunshine state is narrowing to some extent. That may be, but that may also be a function of the point at which polls were released. If the polls are arranged chronologically, the polls that were in the field most recently show Obama ahead by a four to seven point range.] But there are still other states where the picture isn't as clear. Obama is ahead, but the degree to which he leads hasn't solidified as it has in the former group. We see for example that while Obama is ahead in all five polls in both Nevada and Ohio, there is a difference of opinion as to how much he is actually ahead. Between the two polls in Nevada there is a seven point margin and in Ohio that distance is six points. Again, Obama is ahead, but these are states that may be difficult to read as we head into next Tuesday. There are some subtle changes to the Electoral College Spectrum -- there usually are -- but there's nothing groundbreaking in there. [Fine, Delaware shot up the far left column after that 30 point Survey USA margin.] And the map remains the same as it was a day ago. 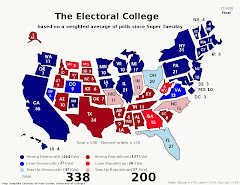 Obama still leads in the hypothetical electoral vote tally by a count of 338-200 and is safe in states totalling 286 electoral votes (strong and lean Obama states). Shifting to the Watch List, Colorado departs, having moved into a firmer position within the Obama lean category. However, Nevada and New Hampshire have been added to the list. On the strength of several double digit polls recently, New Hampshire is within a point of moving into the strong Obama category. As changes go, that one is a pretty quick shift by FHQ standards. Nevada, too, is new to the list. However, the Silver state is not back on to potentially switch back to the McCain side of the partisan line. Instead, Nevada has moved within a fraction of a point in our averages of moving into the Obama lean category. It should be noted that Ohio is within striking distance of joining Nevada in that distinction as well. So, while it may be difficult to ascertain the extent to which Obama is ahead in each of those states, both are actually inching further and further into Obama territory. And as always, keep your eyes peeled for new polling from Florida and Missouri. Those are the two states where the potential shift called for in the Watch List would shift electoral votes in the process. 8:33pm: Impressions? It was a commercial. Did it change any minds? I don't know. As I said, Obama didn't not look presidential and that may be the biggest thing about that 30 minutes. I'll be interested to see the Nielsen numbers when they are released. Other thoughts? The comments section is open for business. 8:30pm: And if that animated Obama logo with the sun rising didn't make you think of Reagan and "It's morning in America," I don't know what will. Let the record show that that was also a change election. 8:29pm: Unity. We always hear that in a change election. There's nothing wrong with that, but it is the reality. We heard some of the same stuff from George W. Bush 8 years ago. The difference? Congress. It will look a lot different on January 3, 2009 than it did on January 3, 2001. 8:27pm: This live event isn't going to be all that long. ...and here it is from Florida. 8:22pm: Well, Kentucky isn't a swing state. They aren't just touting folks from competitive environs. 8:21pm: And here's Joe Biden. Oh, and Scranton, too. 8:19pm: A lot of family moments here. Is it just me or was there a Clinton special like this in 1992? I don't know that it was on the major networks or primetime, but it seems like there was something the Clinton camp did 16 years ago. 8:17pm: On to college affordability and health care costs. It all has an economic tinge to it. 8:15pm: "Live Obama Event Later in Program" We're halfway in, how long is allotted for that segment? 8:12pm: Iraq war money elsewhere? This scene with these intimate audiences is like a throw back to Obama's community organizer days. 8:09pm: Uh, but no nuclear on that energy plan. McCain is likely to bring that up. I don't think it'll change any minds, but I think he'll bring it up. 8:01pm: Introducing us to ordinary Americans. Yeah, this was the most effective thing about the final night of the Democratic convention other than Obama's speech: When they brought out regular person after regular person relating to us why they were supporting Obama. 7:56pm: Well, I just turned the TV on and there is the DSCC trying to take down Saxby Chambliss. They're everywhere today. Radio, TV, you name it. That senate race must really be close. But that's not why we're here tonight. I thought I'd dust off ye olde live blog concept just for nostalgia's sake for the primetime Obama buy. What to expect? Well, I'm told it is an infomercial. NPR even had the King of Informercials on about whether Obama would be able to make the case tonight. He said yes (Yeah, I'll check on that name for you.). It was Ron Popeil, and here is that segment from All Things Considered this evening. 1) Is one of the candidates above the 50% mark in a state currently? 2) Has one of the candidates been the only one to surpass 50% in any reputable state poll? If the answer is yes to both, then that implies there has been some consistency to the candidate being or having been over 50% in those averages. Those are the states that are designated solid states for either McCain or Obama. If the answer to the second question is yes but the answer to the first question is no, that state is a lean state. In other words, there is some potential there for one of the candidates to cross that threshold. It has happened before. However, that support has either waned and is dormant or is latent in the current period. "The idea is that if a state consistently polls 50-47, regardless of the methodology of the poll or the state of the national race, it's very hard for the trailing candidate to win. But if a state has a lot of polls like 46-40, but the leading candidate never breaks 50, the trailing candidate has a chance." "There are two different ways a state can end up a toss-up. One is to have neither candidate reach 50 in any poll since McCain became the presumptive nominee. The other is to have both candidates do it, but to have neither break 50 in the pollster.com average." And how does this change things on the map? "While every change favored Obama, it's worth noting that Florida briefly turned solid Obama between updates, before going back to toss-up status. "I'll also note that under this methodology, the current toss-up's can't go to lean no matter what, because both candidates have had polls showing them breaking 50. They are "battlegrounds"--they can shift to one candidate's camp, but they no longer have the luxury of "leaning," as the race in these states is not due to people who have not yet decided, but rather to people changing their minds." What we are seeing here is the continued surge Obama has enjoyed since the economic downturn at the end of September. The Illinois senator's position has been strengthened and in the process the lean category has contracted rather substantially. We can expect to see that to some degree just based on the fact that over time more and more undecideds are filing in behind one or the other of the two candidates. They aren't deciding and then changing their minds, for instance. What that is coupled with here, though, is the fact that Obama has surpassed 50% in a host of states over the two weeks examined here and the McCain has dropped below that point in a couple of his solid states. But let's bring that up to the present -- as defined as a couple of days ago* -- and see whether the Obama gains have continued. "Yes, Rhode Island is only an Obama lean. That's one place where the 50% methodology isn't very good, because the handful of recent polls are showing a bizarre number of undecideds." What's interesting here is that some of the states -- Pennsylvania and Wisconsin, for example -- where the margins have decreased moderately for Obama are still solid because of the Illinois senator's position relative to the 50% threshold in the polls. Obama is still above that point consistently enough there that those states are still among the most safe for him. "Incidentally, expect significant changes on the Monday night map in this series, because I've been planning a methodology shift. For the very last update, I'm going to change to Pollster's "more sensitive" average; i.e. the one that reacts more quickly to changes. That way if there is some event that dominates the last few news cycles, it will be accounted for." Tuesday brought much more red to the polling on the day, but you'd be hard-pressed to call any of it "good" red. The gap continues to close in Arizona, though the state is still regarded as a strong state for John McCain. Still, as I mentioned on Monday, the symbolism of having your home grow increasingly competitive as the race draws to a close is not a welcome sign for any candidate, much less a candidate trailing in the polls both nationally and in the most competitive states. Elsewhere, a day after a Zogby poll gave the McCain campaign a somewhat comfortable advantage in Indiana, the Hoosier state turns in two polls well within the margin of error with one favoring each candidate. Indiana is still off the Watch List for a potential switch to the blue side of the partisan line, but is perilously close for a state that has been reliably Republican since LBJ's landslide in 1964. Also, there was a bit of a bounce back in the Insider Advantage polling in Georgia. And even though the new poll is red -- an improvement over the one point advantage the firm showed Obama had late last week -- that one point margin is far below what would have been expected in the Peach state as recently as two weeks ago. The case is a bit different in Nevada and Ohio, where the results are a bit more muddled. In other words, we're getting conflicting views of just how much Obama is ahead in the Silver and Buckeye states. The Illnois senator continues to hold leads in both but the depth of that lead is something of a question mark. Of the two polls out in each state on Tuesday, one had Obama ahead by 4 and the other had the Illinois senator up by 9 or 10 points. The underlying message to take home, though, is that Obama is ahead in each throughout most of the recent polling. And both states have slipped off the Watch List into a firm position in the Obama toss up category. All that means is that neither state is within a fraction of a point of returning to the McCain side of the partisan line. And both are creeping in the opposite direction at the moment. Meanwhile, there is Virginia. The Old Dominion looks a lot more like Colorado, Maine and Washington than it does Ohio or Pennsylvania. Unlike Maine or Washington, though, Virginia started out in McCain territory and has since jumped to the Obama side of the partisan line and has sustained those numbers (...as opposed to either a bounce and recession scenario or a mixed results one). Despite that starting point -- a solid Bush state four years ago -- Virginia has now shifted enough to move into the Obama lean category. In the process that vaults Obama into an even more comfortable position ahead of the election next Tuesday. 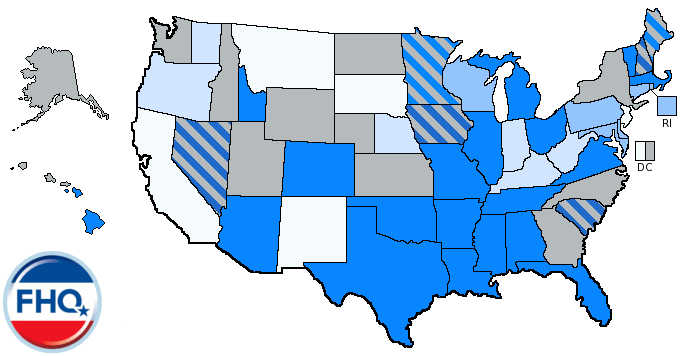 Between the strong and lean categories in the blue, Obama now has 286 electoral votes. Toss up states, then are irrelevant at this point if the goal is surpassing 270 electoral votes. If the discussion shifts to building a coalition of states to claim a mandate, then those toss up states become more consequential. But let's not get too far ahead of ourselves. McCain is down, but he isn't totally out. Though, there are a decreasing number of scenarios where McCain emerges victorious on November 4. For one, as FHQ showed last week, it would take an above average Bradley effect for McCain to pull out a win. Later today, we'll have a little something up about the effect an October (or at this point pretty much, a November) surprise would potentially have on the election. 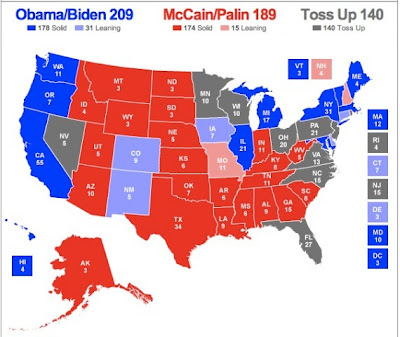 As things stand now, though, McCain will not only have to sweep the remaining toss up states, but he'll have to stretch into the Obama leans or even a couple of strong Obama states -- like Pennsylvania or Wisconsin -- with favorable conditions (demographics, lack of early voting, etc.). Pulling in one or both of those would negated the need for McCain to "have" to win Colorado, Virginia or New Hampshire. Regardless, the Arizona senator will have to sweep the remaining toss up states. Finally, the Watch List loses Montana today on the strength of the Mason-Dixon poll in the Treasure state showing McCain up 4 points. Despite that, the RNC thought the race there to be close enough to drop some cash in the state to protect McCain's position there. Other than Montana, though, there wasn't any movement on the Watch List. Colorado is within a couple hundredths of a point of shifting off the list into a more comfortable position in the Obama lean category and the new poll out this morning from the AP will likely push the Centennial state across that threshold. Colorado, then, is one to watch along with the old stand-bys, Florida and Missouri. Though, it should be said that Florida is tracking toward leaving the list in the way that Nevada and Ohio have recently. Missouri, on the other hand, continues to draw closer. NOTE: Please make a note of the Rasmussen North Carolina poll from a day ago. I mistakenly colored it an Obama one point advantage. It was a McCain lead of one point and the table now reflects that reality. The Tar Heel state is still just outside of being added to the Watch List as a potential switch into the Obama toss up category. How Big a Margin is Too Big to Make Up?